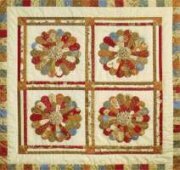 Create Victorian Elegance with a Tussy Mussy Wall Quilt in 21st century prints. 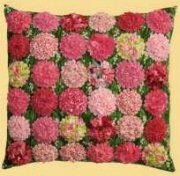 Featuring easy Ruched Blossom flowers and large appliqué, this is a fun project for confident beginners or experienced quilters. 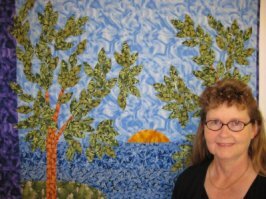 32" x 32"
Laura Estes has been an avid quilter since the early 1980’s. Because she couldn’t always find what she wanted in appliqué’ patterns, she began designing her own quilts. One thing led to another and Laura’s Sage Country Quilts became an official business in 1994. 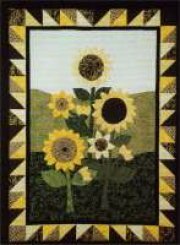 In 1997, a line of quilting stencils produced by Quilting Creations International was under way. 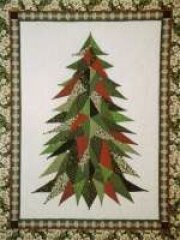 Laura’s line of patterns and quilting stencils are marketed worldwide. Most of the designs are for appliqué. Gardens, flowers, hearts and cats play starring roles in most of the designs. Doodle art form high school days and a German heritage class also influence her design choices. Laura enjoys teaching quilting skills and speaking on the subject of creating heirloom quilts. She takes great pleasure in seeing students progress in their quilting knowledge and ability, creating quits uniquely their own. Laura and her husband Pat live in Odessa, WA, located in the semi-arid desert area of Eastern Washington. Scabrock sage brush and deer are close at hand. One glossy black cat named Black Jack (B.J.) orders their life. When not quilting, Laura writes a recipe column for the Odessa Record, titled “Welcome to My Kitchen.” She enjoys cooking, gardening, reading, singing, crossword puzzles and spending time with Pat and B.J. What got you started quilting? I got started quilting because the yarn shop I worked for joined with the next door fabric shop just as quilting was returning to popularity in the 1970’s. All employees had to learn a basic knowledge of the other craft. Though I still knit and crochet, quilting took over as my main fiber arts interest. What is your favorite pattern that you have designed? My favorite pattern? I really can’t say. If I don’t really like the pattern a lot in the first place, it never makes it to a completed model and printed pattern. They are all favorites. What do you enjoy doing when you aren’t quilting? When I am not quilting, I enjoy gardening which is really making quilts in the flowerbeds to my mind. What is your favorite quilt related memory? Quilting retreats hold my fondest quilting memories, spending time with quilting friends. Do you like Laura's designs?